Apple’s latest Mac operating system, Leopard, has, we are told, over 300 new features. Many of these are minor, but in this part of my Leopard review I’ll concentrate on three of the big ones: Quick Look, Time Machine, and Spaces. One of the nicest new features for me is Quick Look. Select any file in a Finder window, press the spacebar, and you’re instantly previewing the file in Quick Look. “Quick” is the operative word here; whereas it might take you 10-20 seconds to fire up Microsoft Word or NeoOffice to view a .doc file, with Quick Look you’re viewing it within 1 second of hitting the spacebar. Text files – whether that’s Word documents, PDFs, or plain text – open with a viewer that lets you scroll up and down through the whole document. When previewing images, you get an Add to iPhoto button to add the displayed image to your iPhoto library. An audio or movie file opens with a play/pause button and a scrubber control for jumping around within the content. … and so on. In all cases, you can click a button to view the file in full-screen mode and, if you Quick Look multiple files at once, you can view a contact sheet of thumbnails to choose from (this, combined with the full-screen mode, looks great with photos!). Quick Look uses plug-ins to work its magic; each file type needs an associated plug-in to be rendered in Quick Look. 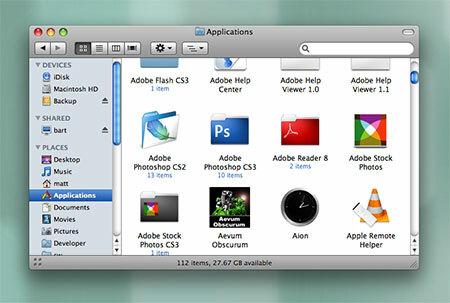 Naturally, Leopard ships with plug-ins for most common file types, and app developers are adding more all the time. I’ve talked about upgrading Mac OS X Tiger to Leopard, and about Leopard’s look and feel compared to Tiger’s. Here I’ll look at the new Leopard Finder, and talk about the Spotlight search feature in Leopard compared to its Tiger counterpart. Finder in Tiger, while serviceable, always felt a bit clunky to me. Opening big folders was sluggish; the sidebar had its limitations; network shares were handled poorly. In particular, the way the entire system would hang when a network share dropped was appalling. The Finder in Leopard is a definite improvement. Big folders open quickly. Preview icons take less time to render. The sidebar is nicer looking, and actually lists other computers in your network in the sidebar – this is a wonderful feature, as any network share is now only a couple of clicks away. But most importantly: No more system hangs when working with network shares! Not only do shares drop less often (despite Leopard’s Airport going up and down like a yo-yo – not sure why), but when they do, there’s no beachball for 10 minutes. This makes working on my wife’s Mac over the network actually usable now. After finally upgrading both the Tiger iMacs in our house to Leopard last week, I can now see what I’m getting for my AUD $250. I’ll start with initial impressions of the new Mac OS X, then move onto specific apps and features in later parts. Steve must have been watching a lot of Star Trek over the last couple of years. Leopard has a distinctly space-age feel, with its starry desktop background, glowing lights in the Dock, and Doctor Who-style Time Machine. Personally I’m not ecstatic about the look, but it’s inoffensive enough (though Time Machine’s animated swirly stuff is overkill and distracting). I actually really like the much-maligned translucent menu bar and shiny 3-D Dock. The translucent menu isn’t as distracting as I’d imagined, and I like the “solidity” of the Dock’s shelf. I particularly like the way application windows are reflected in the shelf. Utterly pointless, but beautiful. I’m not convinced by the glowing dots used to show active apps; sure, they fit in with the space-age theme, but they’re hard to notice. I keep thinking they’re part of the starry desktop background (which I know I could change, of course). I preferred the way Tiger used a black triangle to indicate an active program. Application windows have been unified into a consistent, reassuring dark grey shaded look. It’s a definite improvement on the mish-mash of window styles in Tiger (even amongst Apple’s own software). Leopard’s Close/Minimize/Zoom window buttons are slightly more saturated and “boiled sweet” looking than Tiger’s, and the pull-down menus in the menu bar now have rounded bottom corners – small details, but I like them. I’ve put off upgrading to Leopard for months, largely due to the raft of problems and complaints from other Apple customers. Plus it didn’t seem to offer any compelling reason to upgrade from Tiger. I finally decided that, since I blog about Macs all day long, I really should be running the latest and greatest Mac OS X. So last week I forked out for Leopard. I’ve installed it on both our iMacs and have been using it a few days. Already I have a ton of things to say, but I’ll kick off at the beginning: How well did the upgrade from Tiger to Leopard go? I recently wrote about the latest shareware offering from MacHeist: the MacHeist Retail Bundle, where you get 12 shareware apps for 50 bucks total. Well, not to be outdone, MacUpdate has announced the MacUpdate Promo Bundle. With the MacUpdate bundle you get 10 applications for $65: a hard disk housekeeping app, a heading/logo/button generator, an app to access iCal calendars from the menu bar, a nifty file locator, a creative writing aid, a keyboard macro tool, a DVD converter/shrinker, an audio recording app, a Flash slideshow maker, and Parallels Desktop (which needs no introduction). There is a catch though: 3 of the apps (including Parallels) are locked at the time of writing – which, I presume, means you can only use the apps in demo mode – until MacUpdate Promo has sold a set number of copies. Personally I dislike this kind of marketing shenanigans, but each to their own. It seems likely that all the apps will eventually be unlocked. Want to know how big a folder is in Mac OS X, including all the files and nested subfolders inside it? This can be very useful, especially when you’re trying to reclaim some disk space. Here’s how to do it. You can then click an arrow to the right of a folder to expand it and view the sizes of all its subfolders, and so on. Easy! For some reason StuffIt ended up getting installed on my wife’s iMac. All very well, but I started finding its presence, and its association with every zip file on the Mac, somewhat annoying and unnecessary (what with unzipping now being built into Mac OS). So I tried to uninstall it. Easier said than done! There’s no uninstaller, and what’s more, it insinuates itself into every nook and cranny of Mac OS, and is a pig to remove manually. 12 Shareware Mac Apps for $49? That’s MacHeist! Last week a rather spiffing software bundle was released to an unsuspecting public: the MacHeist Retail Bundle. For $49 you get 12 fully-functioning shareware Mac applications worth over $250. Not bad eh? Apps include an iTunes alarm clock, a money manager, an iTunes controller, a digital assistant/organizer, a posh clipboard manager, a quick application launcher, a password safe, a no-nonsense word processor, a tool to slim down and speed up your apps, and 3 games. Even better, 25% of the purchase price goes to charity. Can’t say fairer than that. There’s also a referral system whereby you can get extra shareware if you refer friends to MacHeist (at least I think that’s how it works – it’s a bit confusing!). I haven’t tried any of the apps in this bundle so they might be terrible (though DEVONthink and WriteRoom sound pretty cool), but at just under 50 bucks you can’t go far wrong I guess! Posted in Software | Comments Off on 12 Shareware Mac Apps for $49? That’s MacHeist! Games are an area where Windows fanboys love to gloat over the Mac. It’s true that Windows has a much bigger range of games available (although thanks to Boot Camp and the like this isn’t such an issue these days). However there are some pretty decent games for the Mac too, and many of them are even free! Here are the top ten best free Mac games currently available – in my humble opinion. I hope you enjoy reading, and playing the games! This racing game is an homage to the classic Super Mario Kart game. For those not familiar with the basic theme, you race a go-kart on a series of wacky tracks, picking up various specials along the way such as speedups, rockets to blast other karts, and so on. This game is at pretty early stage of development so graphics and levels are fairly basic, but it’s still great fun to play, and is a great game for kids! One of the things I used to hate about Linux was the way NFS mounts would hang for 10 minutes on one machine if the other computer crashed or lost its network connection. This, along with countless other niggles, was what made me switch to an “It Just Works” Mac. Well, when it comes to network hangs and freezes, my Mac isn’t as bad as Linux. It’s worse. I frequently need to connect to my wife’s iMac from my own (or vice-versa). 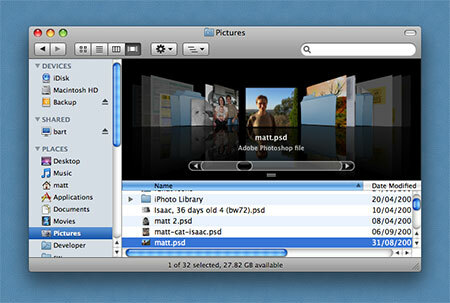 To do this I go to Finder and choose Go > Connect to Server, then connect as myself and mount the remote iMac’s “Macintosh HD” on my iMac. So far so good. The problems start anywhere from 5 minutes later to a few hours later. The first sign is usually a dreaded spinning beachball in Firefox. Then I try to switch to Mail. Unresponsive. The Dock doesn’t work. Can’t switch to the Finder. Photoshop has frozen. Can’t do anything – it’s a beachball bonanza. At least with Linux an NFS hang would only bring down one or two apps. With Mac OS X, the entire system is toast. If I’m lucky, then after around 10-15 minutes, a dialog will pop up announcing “Server connection interrupted”, offering me a choice of just one button: Disconnect. At this point, the entire Mac springs back to life. If I’m unlucky, I need to power off one or both of the iMacs to get things moving again. Is it so hard for Apple developers to write an operating system in a way that doesn’t bring the entire computer to a screeching halt, just because a network connection is interrupted? There’s nothing quite so frustrating as being in the middle of some work, only to have your entire computer freeze just because the stupid thing can’t talk to another computer at the other end of the house. Does anyone know a way to stop these kinds of hangs? I’ve heard rumours that it’s “better” in Leopard (I currently use Tiger); if true then it might be the motivation I need to upgrade! You are currently browsing the Reality Distortion: Macs, Mac OS X, and Apple stuff weblog archives for April, 2008.